Liquid Time is an interactive installation in which a participants physical motion in the installation space fragments time in a stored video clip. A participant"s movement in the space is tracked by an overhead video camera. As the participant moves closer to the projection screen they push deeper into time - but only in the area of the screen directly in front of them. As they move away the fragmented image heals in their wake - like a pond returning to stillness. In the Liquid Time installation, the interface of one"s body - which can only exist in one place, at one time - is the means to create a space in which multiple times and perspectives coexist. 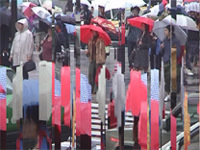 The resulting imagery can be described as video cubism. In an exhibit at New York University in 1999, Liquid Time cycled through a series of 7 video clips, changing clips every 5 minutes. The clips explored different sensations and spaces - using a range of imagery and various types of camera movements. The imagery ranged from the realistic to the abstract, and explored different camera moves or techniques, such as shooting on a tripod or hand held. All the footage was taken from areas familiar to people at the university. By interacting physically with this imagery, participants experienced new perspectives on familiar spaces. Starting in 2001, Liquid Time is being redeveloped into a series of pieces each exploring imagery of a urban infrastructures. Each piece is composed of imagery from a site where humans, data, or other physical matter are transferred from one place to another. In the first piece in the series - "Crossing" - developed and exhibit this summer in New York, visitors interact with abstract imagery of the Brooklyn Bridge. 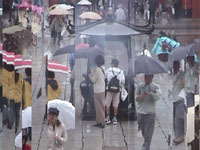 In a second part of the series developed and exhibited this fall in Tokyo, participants interact with images of pedestrians at various well-known sites around Tokyo.